Should I Buy a House in 2015? 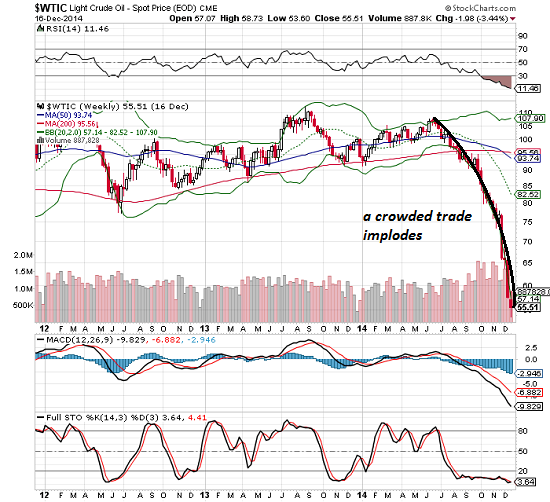 Will the Fed Intervene in the Oil Market? What Will It Take to Be a Superpower in 2025? What Is the Gold-Oil Ratio Telling Us? 2015 Housing Trends: Will the Echo Bubble Continue Expanding? Considering the reality that only the top 5% have benefited from the policies of the past six years, it's difficult to see how the Echo Bubble can continue expanding in 2015. After two years of bubble-type price increases, the big question for housing in 2015 is: will the Echo Bubble continue expanding, or will it follow its 2002-2007 sibling's epic bubble pop and decline? To answer the question, we first need to identify the key trends that have enabled the expansion of the Echo Bubble. There are three key dynamics underpinning housing's Echo Bubble. 1. The unprecedented intervention of the Federal Reserve to push mortgage rates to historic lows.Nothing fancy here; lower rates serve two purposes central to the policies of central banks everywhere: they enable marginal buyers to qualify to buy homes, and they boost prices higher. 2. 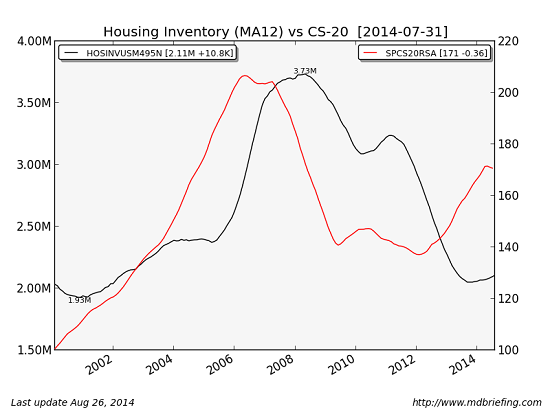 The post-2008 slump in housing construction and the demand for rental housing pushed inventory down and demand up. This led to a classic imbalance of supply and demand: as demand by investors and overseas buyers rose, inventory fell. Prices naturally skyrocketed in areas with tight inventory and high demand. 3. The end of the Fed's monetary easing/money-printing devastated the periphery emerging-market economies, forcing capital to flee to safe havens such as U.S. real estate. As China and the emerging economies that had boomed as Fed money poured into their economies rolled over, those who had accumulated fortunes rushed to transfer their wealth (often ill-gotten) into safe havens such as the U.S. The goal wasn't just to transfer capital, but safeguard the families' physical safety; buying a house with cash is the ideal solution. This dynamic has fueled a vast all-cash housing trade in areas favored by foreign capital: New York, Miami, Los Angeles, San Francisco, Vancouver, etc. 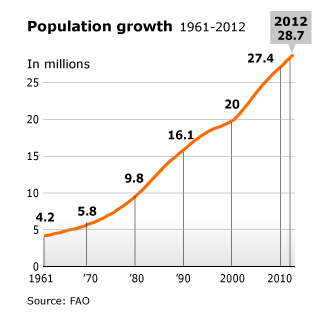 The question then boils down to: are these trends likely to continue or fade? To answer that, we have to refer to a fourth dynamic, one that undermines the entire Echo Bubble: the erosion of household income. 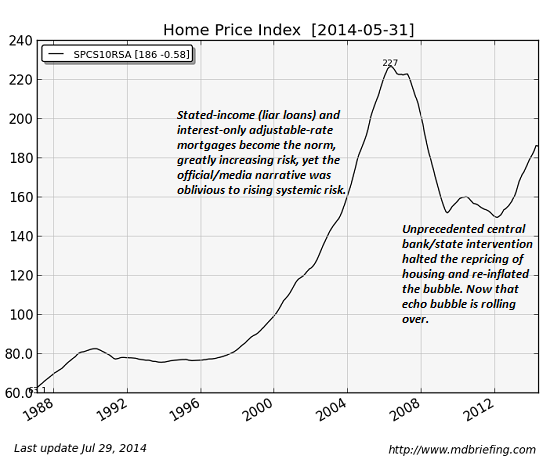 How can housing prices keep rising as household income continues declining in real terms? The Fed and federal housing agencies have reversed the natural downward pressure on demand and prices by making mortgages incredibly cheap and reducing the down payment requirements. This enables marginal buyers to qualify, but the previous housing bubble revealed that enabling marginal buyers to qualify for mortgages triggers a time-bomb of defaults: last ones on, first ones off. Marginal buyers are the first to default when lay-offs, divorces, medical crises, etc. arise, as they inevitably do. 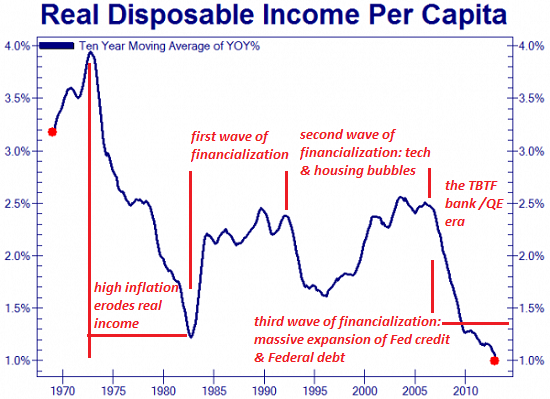 Here is a chart of per capita income. This broad measure of income doesn't reflect the enormous skew in household income to the top 5%--a reality that is thoroughly covered by Doug Short in Household Incomes Across Time: The Divergence at the Top 5%. In effect, most of the gains in income and wealth over the past decade have flowed to the top 5%, leaving the bottom 95% with stagnant income and net worth. Let's consider each of the three trends that have pushed prices higher. Mortgage rates: it's difficult to see how rates can decline much further, as they are already near-zero in real (inflation-adjusted) terms. there is precious little incentive for lenders to accept the risk of default for near-zero returns. The Federal housing agencies appear to have recognized this limit, which is why they're pushing near-zero down payment loans again. Inventory. Courtesy of Market Daily Briefing, here is a chart of inventory and the Case-Shiller house price index. Inventory plummeted in the past few years, and remains low. 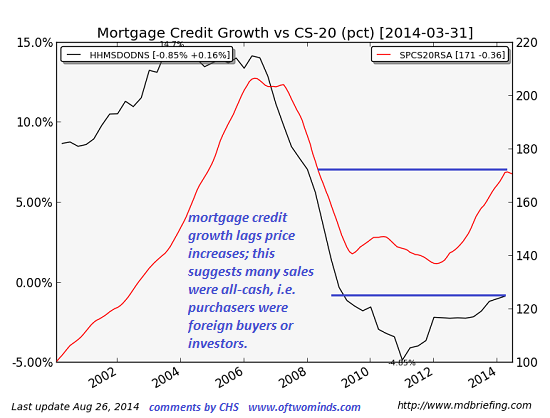 Cash sales/mortgage credit. This chart of mortgage credit growth and the Case-Shiller house price index shows that mortgage credit has lagged the explosive rise in price, suggesting much of the price appreciation has been driven not by Americans buying homes to live in, but foreign buyers and domestic investors paying cash. Is there any limit on the number of foreign buyers with hot money to launder by buying U.S. houses? That's an unknown with multiple variables. The imposition of capital controls in periphery economies could trigger a tsunami of hot money seeking safe haven. But once that wave breaks, the flow of hot money could subside. We might also ask: is there any limit on demand for rental housing? Investors flocked into housing in the great chase for yield in a zero-interest rate economy, but the sharp rise in rents in many areas may be reaching limits on what households can afford to pay. 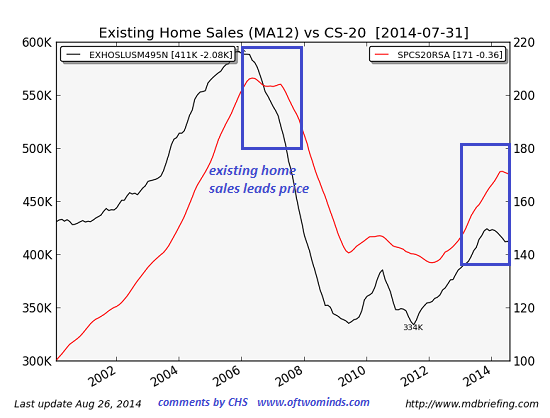 We see a hint of slackening demand in this chart of home sales, which tend to lead price. As sales decline and inventory slowly rises, prices tend to follow. Will the Echo Bubble continue expanding in 2015? Let's answer with another set of questions: is a housing market that is dependent on marginal buyers who would never qualify to buy a house with prudent risk management a sustainable market? Is a housing market that is dependent on hot money from overseas buying houses for cash a sustainable market? Is a housing market that is dependent on investors buying homes to rent a sustainable market? Considering the reality that only the top 5% have benefited from the policies of the past six years, it's difficult to see how the answer is "yes." 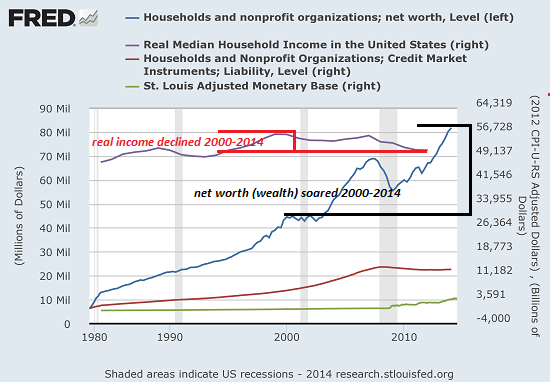 Income has gone nowhere, while the wealth of the top 5% has soared. Is that a healthy economy that can support a sustainable rise in house values? No, it isn't. Thank you, Tom R. ($20), for your much-appreciated generous contribution to this site-- I am greatly honored by your support and readership. No one can answer that question for anyone else, but it seems prudent to ask the question in the context of an Echo Bubble in valuations that appears to be deflating. Readers often ask me if now is a good time to buy a house. This question has appeared in my inbox for the past nine years, as the Housing Bubble reached its climax, burst, and an Echo Bubble arose in its place. It’s a tough question, as you know, for reasons that are inherent to buying and owning real estate, and to the uniqueness of every household's finances and needs. So I always start by saying I can't offer any advice or even suggestions, because everyone's situation is unique. In many cases, readers are seeking reassurance that it's OK to buy a house for reasons other than financial: they're having another child, their parents need them close at hand, and so on. This is the dual nature of housing: it is both an enormous financial commitment and home/shelter. 1. The size of the financial commitment outweighs every other expense and risk of capital. Mortgage, property taxes and maintenance typically consume more of the household budget than any other item. 2. Housing is illiquid and the transaction costs are high. If I want to sell $200,000 of Apple shares, the cost is a trivial sum and the transactions is completed in a few seconds, as Apple stock, like most large corporate shares, is highly liquid. If I want to sell a $200,000 house, the process typically takes months and costs between 7% and 10% of the asking price in commissions, closing costs and fees. Should I buy a house in 2015? Rather than seek a yes/no answer, let's try to identify some key reference points to consider. 1. Length of occupancy. If somebody buys a house with a fixed-rate mortgage and has a realistic plan to live in the house for 20+ years, fluctuations in value and demand don't matter much. 2. The potential consequences of a decline in value if the Echo Bubble pops. If, on the other hand, somebody is buying a house that they plan to sell in a few years to fund their retirement, that's a very different set of risks. If somebody buys a house for long-term shelter and location for $400,000, and it drops to $200,000 five years into their ownership, it hurts their net worth but has no real effect on their daily life. As long as they can continue to pay the mortgage, life goes on. The person who has to sell to fund their retirement, on the other hand, is devastated by the decline from $400,000 to $200,000. Daily life is much harder after the loss of $200,000+ in irreplaceable capital. 3. What else could you do with the capital sunk into a house? One way to consider this question is to consider the relative value of housing in something other than dollars, for example, to price housing in alternative investment options such as gold and stocks. 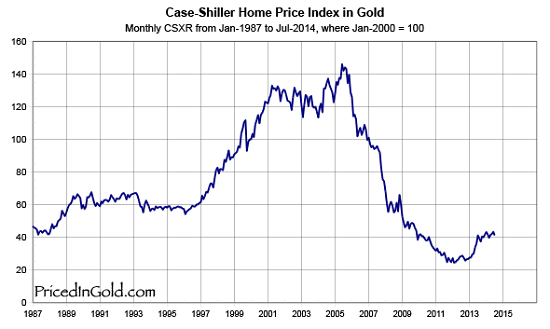 The website Priced in Gold has some interesting charts reflecting the ratio of gold to housing, as measured by the Case-Shiller Index. One way to think about this is to ask: how many ounces of gold does it take to buy the median-value home in my area? As investors, we ideally want to buy assets at their relative bottom and sell them at their relative top, and switch out from fully valued assets into relatively cheap assets. 4. Can you pay all housing costs out of one paycheck? People naturally calculate their ability to pay on their present circumstances, but the possibility of global recession and financial instability should give us pause. Rather than assume household income will remain stable or increase in the years ahead, it is prudent to consider the possibility that one earner loses their job and is unemployed for an extended period of time. If the house cannot be paid for out of one income, the household is risking default and loss of all the invested capital should one wage earner lose their job. This is the problem with the fixed costs of owning a house: the costs are inflexible. The county doesn't care that you lost your job; the property taxes must be paid or the county will pursue auctioning off your property to pay the tax liability. Renters can move much more easily than home owners, so one cost in buying a house is a loss of flexibility and the burden of fixed costs. 5. 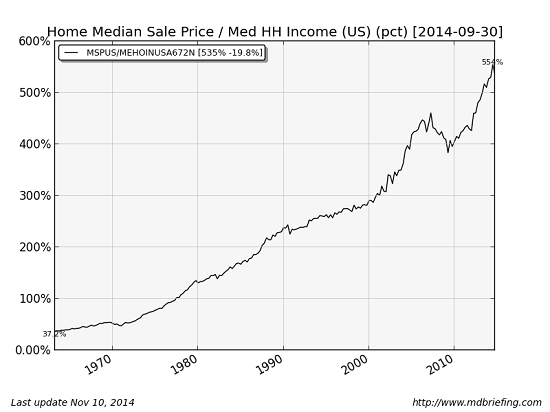 How is housing priced in terms of median household income? Another way of assessing the relative value of housing is to measure the price in terms of median household income. Yes, low mortgage rates means mortgage payments are smaller than they were in previous eras, but income is still the foundation of debt, including mortgages. Should I buy a house in 2015? No one can answer that question for anyone else, but it seems prudent to ask the question in the context of an Echo Bubble in valuations that appears to be deflating and household income that is potentially at risk of declining further in a global recession that eventually impacts the U.S. economy. Thank you, Pad S. ($60), for your stupendously generous contribution to this site-- I am greatly honored by your support and readership. Lies are no substitute for truth and fantasy is no substitute for reality. Follow the money is a good start--but what matters going forward is income, and most especially, net income and disposable income. Debt is important, money/capital flow is important, but when push comes to shove, all that matters is having net income/disposable income: to service debts, to invest, to spend. Debt can be substituted for income, but not for long. Central banks have been playing a game for six long years: by lowering interest rates and making credit available, the central banks have encouraged households, enterprises and governments to substitute borrowed money (debt) for income. This works as a stop-gap, but debt accrues a funny thing called interest that eventually eats the borrower alive. Income is (supposedly) the driver of stock valuations, the financial foundation of rental property and the ultimate arbiter of solvency: households, enterprises and governments whose income cannot meet their debt and spending obligations are insolvent and eventually declare bankruptcy. The reality that all that really matters is income incentivizes gaming income. Corporations and their officers/stockholders benefit greatly when net income appears to rise smartly, as rising income boosts stock prices and the value of stock options. So it's no wonder that S&P 500 Profits Are 86% Higher Than They Would Be Without Accounting Fudges. Fudging operating income with accounting trickery pays such huge dividends, why not indulge in a bit of financial flummery? The chances of anyone questioning the sleight of hand is nil, since the entire financial sector relies on systemic flummery for its profits. Following the income leads us to wonder how the 99% of households whose income is declining in real terms can borrow and spend more every year. Following the income leads us to wonder how OPEC oil exporters will manage with $250 billion less income in 2015, after suffering a $200 billion decline in 2014.That's a total of $450 billion of income that's vanished in a few years. Since OPEC accounts for about 40% of global oil production, that means oil producers globally will earn $1 trillion less than they did in 2012. Such primary industrial income has a multiplier effect, which means every $1 of oil income that vanishes means $3 down the spending chain vanishes as workers earn less or are laid off, the stores that depended on oil workers' spending take a hit, and so on down the line. Thus the reality is the loss of income isn't merely $1 trillion--it's more on the order of $4 trillion, as the multiplier effect subtracts income from everyone in the food chain who depends on oil revenues in a secondary or tertiary role. Income matters for another reason. Most households, enterprises and governments spend the vast majority of their income in one way or another. If income declines by 5%, that may not appear like much. But if the household, enterprise or government spends 98% of its income on debt service and essentials, that 5% decline puts them in the red by 3%. It may be possible to borrow more to fill that gap--in essence, borrowing money to pay the interest on previous debt--but this is a financial Black Hole, as there is less income to service rising interest payments. Once the gravity of insufficient income pulls the household, enterprise or government over the event horizon of insolvency, implosion is inevitable. So when you read about ever-rising corporate profits, ask if that's pro forma or actual net income. When the government claims its deficits are declining, check whether its debts are rising faster than the media is reporting. When your neighbor seems to be spending more, ask if they're making more net income, or simply borrowing more. Borrowed money is no substitute for net income. The global economy has been living a Grand Lie for the past six years: that borrowing money can be substituted for declining income, and bogus accounting can be substituted for real net income. Six long years of lies has persuaded many that the lies can be sustained for another six years--or even sixty years. But lies are no substitute for truth and fantasy is no substitute for reality. The erosion of net income will eventually matter, maybe not in six years but within six months. Thank you, Daniel E. ($5.25), for yet another marvelously generous contribution to this site-- I am greatly honored by your steadfast support and readership. 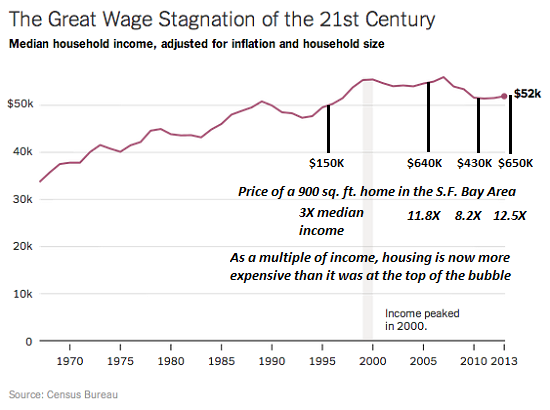 The end of rising wages = the end of mass affluence: we just enjoyed the Last Christmas in America (TLCIA). The government responded to the high unemployment, rampant inflation and rising budget deficits by manipulating data to mask the politically inconvenient realities of inflation, unemployment and deficits by playing with Social Security Trust Funds, inflation data, etc.--games it continues to play to cloak reality from the media-numbed public. The economic stagnation, despite various stock market rallies and false starts, essentially lasted 10 years, from 1973 to 1982. The malaise had a happy ending: huge new oil fields were discovered in Alaska, the North Sea, West Africa and elsewhere, ushering in a renewed era of cheap, abundant petroleum. President Reagan re-set Social Security for a generation and introduced a lower taxes, higher permanent deficits ideology that is now accepted as the only possible way to sustain the Status Quo: deficits don't matter, even when they reach the trillions, because our good friends the Gulf Oil Exporters and Asian exporters will buy all our debt forever and ever, keeping interest low forever and ever. Then the U.S. created and launched two revolutionary technologies which both created new wealth around the globe: the personal computer (microprocessor and cheap RAM) and the Internet (TCP/IP, Ethernet, and the commercialization of Tim Berners-Lee's World Wide Web with free browsers) spawning the generation-long boom of the 1980s and 90s. Those "saves from stagnation" were one-offs; there will be no more supergiant energy finds, nor any equivalents of the Internet expansion cycle. When the wheels inevitably fell off the Internet/tech boom in 2000, the U.S. did not create a new engine of wealth: it opted instead for a devilishly insidious simulacrum of wealth: debt which rose at an exponential rate throughout the economy. Borrowed money and phony financial legerdemain (mortgage-backed securities, derivatives based on the MBS, etc. etc.) from 2000-2007 created what I have termed a "bogus prosperity": no actual new productive wealth was created, only a brief and self-liquidating bubble of debt-based housing and stock valuations. Here is real median household income and labor's share of the economy: both are in structural decline, and inflating asset bubbles has done nothing to reverse either trend. Why will Christmas 2014 be the last Christmas in America? 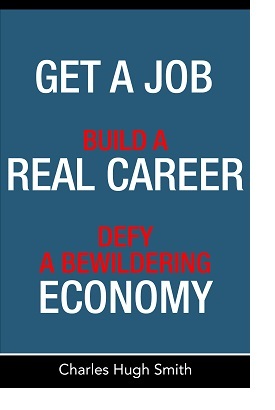 It's simple: declining wages cannot support an ever-expanding mountain of debt. 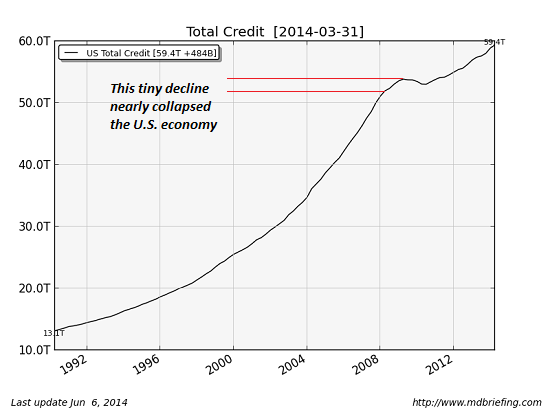 The Federal Reserve has played a game for six long years of lowering the cost of debt (i.e. the rate of interest borrowers must pay), which has enabled stagnating wages to support ever heavier debt loads. There is an endgame in sight to this financial trickery, a point of diminishing returns to lower interest rates: the Fed can't drop rates lower than 0%. Borrowers simply can't qualify for more debt, regardless of interest rates. The extreme fragility of an economy based on ever-expanding mountains of debt piled on declining incomes is apparent: if the Fed can't raise interest rates even a tiny quarter point without threatening to collapse the unstable pyramid of debt-based affluence/ consumption, what does that say about the fragility of the "growth" (supposedly running at a hot 5% annually) and "prosperity"? Claiming that a few hundred dollars in lower gasoline costs per household will enable a desert of declining income to bloom is the equivalent of claiming that an inch of rain in Death Valley will transform the desert into a lush tropical rain forest. Remember the lackluster Christmas of 2014 well; the endgame of expanding debt will play out as every endgame does: furious moves by central bankers will prolong checkmate but not transform the inevitable loss into a win. 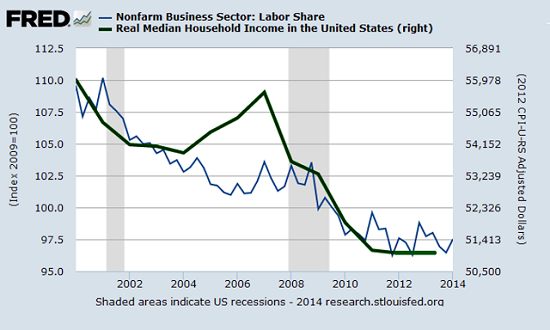 Media sound and fury are no substitute for rising real household wages and incomes. Thank you, David F. ($50), for your stupendously generous contribution to this site-- I am greatly honored by your support and readership. Now that I'm out of the pen, I'm enjoying a modest fund-raising success on a street corner here in town. Whenever I get a cheery form Christmas letter from family and friends, recounting a variety of glorious travel and career exploits, my first instinct is to begin composing a parody of the genre. My wife observed this would reveal my true psychological profile (yikes! ), but since you have (mostly) tolerated my various inanities over the past year, I decided to share the results anyway. I hope this holiday season finds you well and in good cheer. Things are certainly looking up here, as I managed to extricate myself from Federal prison last week by hocking the house. It was all a setup--the quarter-ton of Canadian OxyCotin in the trunk of the Cadillac, the empty Jack Daniel bottle in my lap, the "Cheney 2016" bumper stickers, the inflammatory Mo Tzu literature littering the back seat, the Twinkies wrappers, all of it. Now that I'm out of the pen, I'm enjoying a modest fund-raising success on a street corner here in town. I have plugged my trusty Les Paul electric guitar into a portable amp and my sign reads, "Give me money and I'll stop playing 'All Along the Watchtower.'" I got the idea from those endless PBS torture-fests known as "pledge drives". I think the eye-patch and all the barely healed wounds are eliciting the sympathy of passersby, though I do hear some negative patter and have been robbed a few times. But hey, life is good! I'm hacked off that Mo Tzu's name and ideas are being smeared along with my own, but Christmas is a time for joy and gratitude and I'm trying to look past the business failure that wiped out the last of our savings, my injuries, my countersuit against the government (hopeless, I know) and the fact that I have to tape my left hand to the guitar in order to play. The pets are doing OK, though my beloved parrot lost a leg in an accident which I won't describe as it is too painful. I probably told you about the house roof, right? I did get a blue tarp over the gaping hole left by that frozen chunk of airliner latrine waste which crashed right through the rafters; bad things happen in threes, I guess, and since I've racked up six, I should be in for some good luck in 2015. Thank you, readers, for all your astonishing support of this humble site in 2014. I am greatly honored by your readership and look forward to exploring the adventures of 2015 with you. Thank you, Douglas K. ($100), for your outrageously generous contribution to this site-- I am greatly honored by your support and readership. The ability of oil exporters to trigger a short-term collapse in price does not automatically translate into an ability to control the financial conflagration such a crash ignites. My BS detector went off when two stories with similar headlines touting $20/barrel oil were published on the same day. Color me skeptical, but it's almost as if mere $40/barrel oil is no longer enough to get the blood flowing, so both stories blared the more extreme $20/barrel price point. Neither story depicted $20/barrel oil as a brief spike--rather, each presented a future of sub-$50/barrel oil that could last for years or even a decade or longer, matching the period of cheap oil that ran from the mid-1980s to the late 1990s. I have no problem with the idea that geopolitics is driving supply excesses, the goal being to crash the oil revenues of enemies--that's part of my Oil Head-Fake scenario: The Oil-Drenched Black Swan, Part 4: The Head-Fake Disruption Ahead (December 4, 2014). 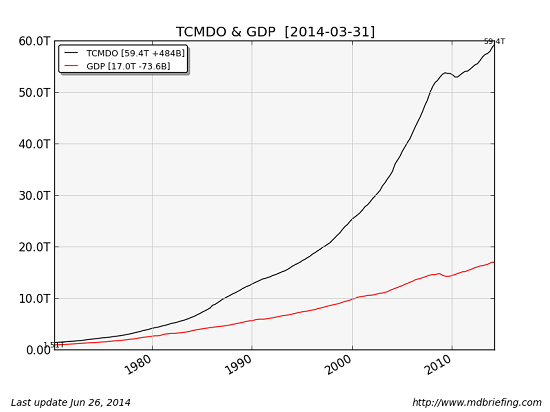 The idea that global demand is stagnating is also common sense, given that the global economy is stagnating. What seems less well-supported is the notion that any single oil exporter can single-handedly pump enough crude to keep prices at $20 or even $30/barrel for years or even a decade. Remarkably, few analysts seem to question this; it's as if the extended period of low oil prices in the 1985-1999 time frame has generated an unquestioned faith in the Saudis' ability to push prices down at will for years on end. The current era is significantly different from 1985-1999. Let's list a few of the critical differences. 2. The OPEC oil exporters' cartel provides about 40% of all oil produced. 3. Total OPEC surplus production capacity is estimated at 2.5 MBD. This relatively modest capacity is the leverage that can supposedly keep prices down for years on end, regardless of what other non-OPEC producers and major consuming nations might choose to do. 5. Saudi Arabia is the largest oil-consuming nation in the Middle East. "Saudi Arabia consumed 2.9 million barrels per day (bbl/d) of oil in 2013, almost double the consumption in 2000." (source: EIA) That's as much as Australia (1.1 MBD) and France (1.8 MBD) combined. 6. These trends--rapid expansion of population, social welfare costs and oil/natural gas consumption--are continuing their upward trajectories. Many other exporting nations have similar profiles: rapidly expanding populations and domestic consumption, hefty fuel subsidies for residents, and expanding social welfare costs. 7. Saudi Arabia and other major oil exporters derive a significant percentage of their national incomes (public and private) from investments in the global financial system--the same financial system that is being destabilized by crashing oil prices. The collapse in collateral and income is not limited to oil exporters with marginally high costs--everyone with a stake in the interconnected global financial system will suffer losses as the financialized-oil trade unwinds violently and unpredictably. 8. The oil exporters' ability to control a global financial meltdown triggered by crashing oil prices is nil. All of which is to say that the ability of oil exporters to trigger a short-term collapse in price does not automatically translate into an ability to control the financial conflagration such a crash ignites, or an ability to effortlessly maintain oil at $20/barrel for years. I will have more to report on this topic next week. Thank you, Michael B. ($25), for your splendidly generous contribution to this site-- I am greatly honored by your support and readership. In a larger sense, the Fed is already intervening in the oil sector via its zero interest rate policy (ZIRP) and its unlimited liquidity for financial speculation. The problem with financializing a critical sector of the economy is the financialization process transforms it into a systemic risk. The trajectory of every financialized sector is the same: debt and leverage are piled ever higher on a base of collateral that eventually collapses as heightened risk becomes the Monster Id of a crowded trade. Once the Monster Id burns through the firewalls that were supposed to limit risk, the crowded "safe" trade blows up and the conflagration quickly spreads throughout the financial system. Every financialized sector thus has the potential to take down the entire financial system. The mortgage sector is a prime example of this dynamic. The financialization of the mortgage industry created the subprime mortgage firetrap, which inevitably caught fire and threatened to burn down the entire global financial system. The central bank that encouraged the financialization then has no choice but to intervene to save the system from the toppling dominoes of leverage and risk. Once the mortgage sector was fully financialized--securitized, tranched, packaged into collateralized debt obligations and other derivatives--the implosion of the weakest link (subprime mortgages backed by bogus collateral and liar loans) was baked into the financialization process. As the systemic dominoes started falling, the Too Big to Fail (TBTF) banks had to be bailed out to the tune of trillions of dollars in guarantees, backstops and loans. As correspondent Mark G. has noted, the debtors are left to suffer the consequences of their risky debt, but the big creditors are saved from the consequences of their bad bets. This is the essence of moral hazard--risk is disconnected from consequence by central bank intervention. Gains are privatized, losses are socialized, i.e. borne by the taxpayers and savers whose interest has been siphoned to private banks by the central bank. Now the latest sector to be financialized, oil, has blown up, falling in a parabolic freefall from over $100/barrel to a recent low around $53. And once again, the sector's losses are threatening to undermine sectors with no direct connection to oil. When central banks feign disinterest in intervention, it can be taken as a sign that they're either planning intervention or are already actively intervening via proxies.Central banks play two hands at all times: their propaganda campaign of talking up their intervention ("whatever it takes," etc.) and their sustained opaque interventions via proxies. When it behooves central banks to appear actively engaged in saving stock and bond markets from melting down, their interventions are publicly flogged on a weekly or even daily basis-- for example, the QE campaigns 1,2 and 3. When their interventions exceed their mandate for outright manipulation of markets--for example, buying future contracts in the S&P 500 within the last 15 minutes of trading to push the markets into the green--it's all kept far from the public eye, hidden behind proxies. Given the systemic risks arising from the meltdown of oil, why would the Federal Reserve let this latest implosion spread to the entire over-leveraged system? After six years of continual intervention in financial markets, why would the Fed suddenly cease its labors to keep imploding sectors from destabilizing the rest of the rickety structure? It beggars belief that the Fed would stand by doing nothing, while the financial dominoes from oil's 50% decline start toppling. The question isn't, why would the Fed intervene in the oil market? The question is, why wouldn't the Fed intervene in the oil market? The Fed, via proxies, might buy oil futures contracts to prop up the collateral, and (again through proxies) it might even start buying up impaired high-risk bonds based on oil. In a larger sense, the Fed is already intervening in the oil sector via its zero interest rate policy (ZIRP) and its unlimited liquidity for financial speculation.Should the Fed turn the dial of intervention up by buying futures and oil-based bonds, it is not a new policy--it is simply a matter of degree. The intervention has been going on in every sector since 2008. The implosion of the oil sector is simply the latest outbreak of consequence following cause. Thank you, J. Timothy B. ($5/month), for your massively generous subscription to this site-- I am greatly honored by your support and readership.